Does your community orchard need some money to maintain it? Have you got an idea for a community orchard event in 2018/19? Do you want to increase orchard skills in your community? Pitch for up to £400 to make this happen! As part of our “Helping Britain Blossom” programme, The Orchard Project’s is running a simple and fun way for you to get the funds you need to help you to boost your community orchard just in time for the harvest season. All you need to do is answer a few simple questions to be in the running to receive funding which will be decided through a public vote. 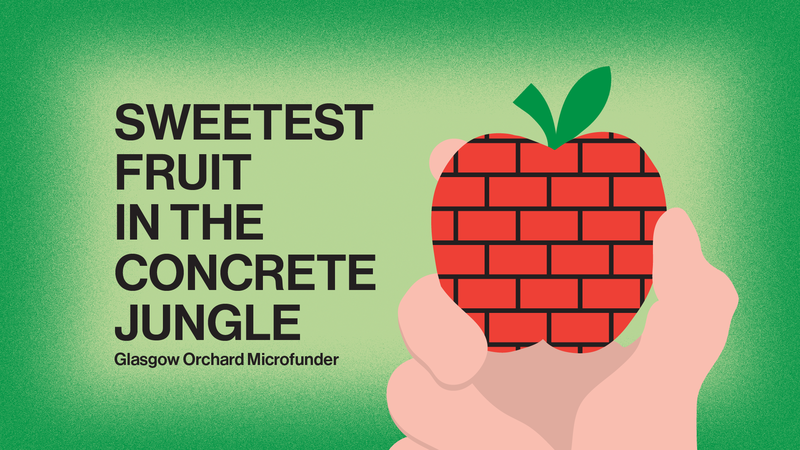 At least one person in your community must be available to attend our Glasgow Orchard Microfunder, 'Sweetest fruit in the concrete jungle' on Sat 8 September to pitch your proposal to attendees from other local community orchards. You might not think that your community growing space is an "orchard", but if it has 5 or more fruit trees you officially have an orchard! Our group has access to a bank account that can receive funds. If so then you can apply for up to £400 from The Orchard Project using this simple form here. Preview the 8 questions before diving in. “Healthy orchard habitats”: maintaining healthy, productive trees and a rich wildlife habitat for a thriving eco-system. “Heart of the community”: bringing local folk together to celebrate the orchard at a seasonal event. “Community skill-sharing”: increasing skills and confidence in how to look after a community orchard. 12 August: Early deadline for proposals. Apply by this date and all eligible applicants receive a copy of the new edition of Fruit and Vegetables for Scotland by Ken Cox and Caroline Beaton and a copy of the Community Orchard Handbook. Sat 8 September: 'Sweetest fruit in the concrete jungle' microfunder with 4 minute pitches from each group. Those attending from other orchard projects get to vote on which proposals get funded. There will also be a programme of useful workshops about how to make the most of your community food growing space. September - March: Successful projects use the funds to run an event or improve their orchard. To start the application click on the big green NEXT button at the bottom of this page. How many groups can apply? Minimum of 5 eligible applications are needed to run the event and a maximum of 15 applications will be accepted. There is a maximum of £400 available for each proposal. What counts as a community orchard? Community space with at least 5 or more fruit or nut trees in a location that generally has open public access. How will the funding be distributed? 'Sweetest fruit in the concrete jungle' is using an approach used all over the world called participatory budgeting. It is based on trusting communities or those with a stake to make good decisions about investments to make things better. Participatory Budgeting is a simple, un-bureaucratic and empowering way to distribute small sums. Have you got any suggestions for how to invest in our community orchard? Watering equipment such as H2Go water carrier & wheel barrow; woodchip delivery; replace a damaged tree; replace rotten or broken stakes; add fruit bushes; a scythe for vegetation management; pruning secateurs and saws; tripod ladder for picking; telescopic fruit picker; bug hotel materials; bird boxes and bath; comfrey roots; tree tags; bench; picnic blankets; refreshments for work session volunteers; path materials. What sort of community orchard events could we hold? Apple Day (officially 21 October) is annual institution. Here's lots ideas on the The Orchard Project website and from the thousands of events in the last decade. Samhain (1 November) is the old Celtic apple day - 'latha meas nan ubhal' - so a Halloween event also ties in nicely. Wassailing is an old Somerset tradition that is gaining traction in Scotland. This festival has some similarities to an old Gaelic midwinter celebration 'Dair na Coille'. Spring Blossom picnics in early May or Beltane celebrations are also becoming increasingly popular. You could could use the fund to big-up your event: press serious amounts of juice by hiring a commercial-grade press and scratter from Locavore or delight the kids with myths and legends of the apple by hiring a storyteller such as Mrs Mash the Storytelling Cook. Have you got any ideas for how we can increase community orchard skills? Hire a sessional worker to teach useful skills such as plant ID, scything, bird-box making; send some of your group to attend a course such as this one and come back and disseminate the knowledge. Encourage a knowledgeable person in your community to share their skills - perhaps buy them a gift in return; buy some orcharding books and start an orchard library; informative signs, noticeboards or labels for your orchard. What is Helping Britain Blossom? Helping Britain Blossom is a partnership between Heineken UK and The Orchard Project, and is creating and restoring over 150 community orchards across Britain. The decisions made during the process are final. The Orchard Project has no influence in the decision making process and is not a funding body. The autonomy lies within the process and the members that take part in the process. The Orchard Project is a neutral body within this process and will not be involved in resolving disputes between members.